Performers include: Jonathan Rhys Meyers, Henry Cavill, James Frain, Natalie Dormer, Nick Dunning, Maria Doyle Kennedy, Anthony Brophy, Padraic Delaney, Jeremy Northam, Guy Carleton, Jamie Thomas King, Rebekah Wainwright, and Sarah Bolger. This historical and fictional series focuses on the early period of King Henry VIII’s reign which tests him both personally and politically. King Henry VIII (Jonathan Rhys Meyers) is the young and ambitious monarch of England and is contemplating declaring war on France after the assassination of his uncle. On the advice of his Lord Chancellor, Cardinal Thomas Wolsey (Sam Neill), the King decides against this course of action. Instead, Wolsey proposes that Henry should endorse a “Treaty of Universal Peace” which is meant to bring peace and harmony to Europe. 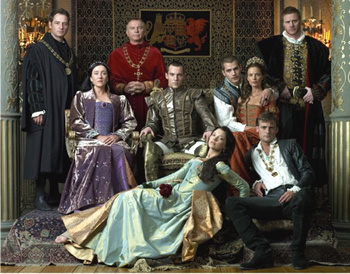 Meanwhile, the King’s domestic affairs become threatened when he discovers that his mistress, Bessie Blount (Ruta Gedmintas), the young and beautiful lady-in-waiting to Queen Katherine of Aragon (Maria Doyle Kennedy), is pregnant with his child. Henry has grown distant from his wife due to his obsession over fathering a male heir and her seeming inability to give him one. Shortly thereafter, Anne Boelyn (Natalie Dormer) becomes his obsession while Cardinal Wolsey rises to power and rules ruthlessly. Against this background, the private lives and political intrigues of several members of the royal court and chancery also play out. Notable characters include Charles Brandon (Henry Cavill), Thomas Cromwell (James Frain), and Sir Thomas More (Jeremy Northam).